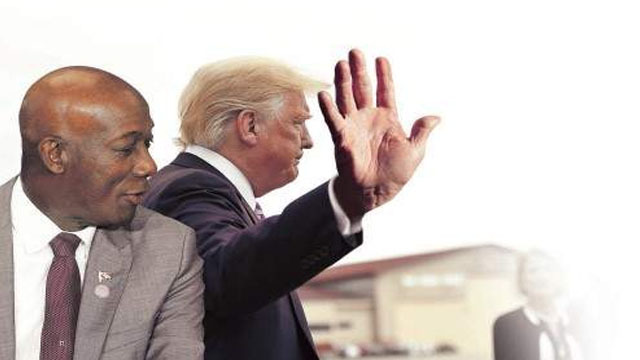 Prime Minister Dr Keith Rowley yesterday brushed aside suggestions that Trinidad and Tobago had been snubbed by United States President Donald Trump who is to meet with select Caribbean Community (Caricom) leaders on the Venezuela issue in Miami today. At the same time, Rowley charged that the countries invited to the meeting — St Lucia, The Bahamas, Jamaica, and Haiti — are the ones that have agreed to be a part of the Lima Group whose objective, he said, “is regime change in Venezuela”. He said it was for those attending that meeting to indicate how that will be achieved. “What we are going to do resolutely and without apology, as a tiny speck on the world’s map, is to stand with the principles of the United Nations where we all have signed on and accept as the best way for peace and security, not only in our region, but the world,” he said of his country. “We, from early — St Kitts-Nevis, Dominica, Trinidad and Tobago, St Vincent and the Grenadines — we did not sign on to the Lima Group. So we are not reacting to an invitation to a man’s house,” he said. “There are people in Trinidad and Tobago who believe that, because Trinidad and Tobago was not invited to the private residence of an American president, we are somehow diminished,” Rowley told a news conference following the weekly Cabinet meeting in Port of Spain, the Trinidad and Tobago capital. He reminded reporters that there were 15 Caricom countries “yet the conversation is about four”. Jamaica’s Prime Minister Andrew Holness left the island yesterday after a meeting of the Cabinet. Government sources had told the Jamaica Observer that Holness had summoned his Cabinet to read them the riot act in the wake of corruption concerns which led him to fire Education, Youth and Information Minister Ruel Reid on Wednesday. Holness was also expected to update the Cabinet members on plans for his participation in today’s meeting with Trump. White House Press Secretary Sarah Sanders said Trump will use the meeting to thank the regional leaders for their support for peace and democracy in Venezuela. She said Trump will also discuss potential opportunities for energy investment in the region. According to Sanders, the United States remains “a good friend to the Caribbean and seeks to build on a proud legacy as the region’s partner of choice”. Holness is slated to return to the island on Sunday. The Caribbean leaders invited had in January supported a resolution at the Organization of American States in not recognising President Nicolás Maduro’s second five-year term. But Caricom leaders at their inter-sessional summit in St Kitts-Nevis last month reiterated their position of non-interference in the internal affairs of Venezuela and said they were prepared to mediate in the process to bring about a peaceful resolution to the crisis in which Opposition Leader Juan Guaidó, with the support of Washington and its allies, is seeking to replace Maduro, who was sworn into office for a second consecutive term in January.